It has been a good weekend of working out. Saturday was a 35 mile indoor trainer ride that I did while watching the movie Munich and playing online poker at Fulltiltpoker.com. Munich is a rather long movie and I was able to complete my 35 miles during the duration of it. Unfortunately I lost a couple of thousand points while playing poker. It was entertaining though. At first I didn’t think I was going to be able to complete this ride. It seemed like a long time to be on my bike indoors. I’ve done longer, but not in a while and I questioned my desire and motivation. In the end I felt good throughout and perhaps is a sign that I am coming along with doing long rides again. After my ride, I headed to the pool with my kids for their swim lessons. Normally I swim during this time, but not today as some kid puked in the pool. Therefore it was closed due to contamination by hazardous materials. I had neither the time or inclination to try to do this swim later on. The highlight of the weekend was the run I did today with Larry. I wasn’t sure about doing it when I woke up since the temperature outside was only 17 degrees. My coach recommended that I stay indoors during the colder temps since I am just getting over a cold. I called Larry at 8:12 this morning to see if he still wanted to do it and his comment to me was simply “of course” and “dress warm”. I figured what the hell, as it’s been a while since I trained outside and there was a time when I liked being out in the bitter cold. I dug out all of my cold weather gear and met Larry on my corner at our appointed time. Larry took me for his two bridges run. This means heading down Flatbush Avenue to the Manhattan Bridge, followed by a short trip through Chinatown and back to Brooklyn over the Brooklyn Bridge. It was a bit windy at times, but spectacularly clear and sunny. In fact, when the sun was shining in my face I was practically blind from the glare and fog on the lenses of my eyeglasses. The bridges and streets were mostly deserted as I suppose everyone decided to stay indoors and avoid the cold temps. 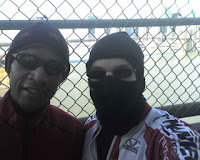 Here is a picture of us from the Manhattan Bridge looking south to the Brooklyn Bridge. I guess I was dressed properly for the run, as I never felt cold during it. I always loved that feeling of being outdoors and properly protected so that you can’t feel the elements. It gives me the feeling of moving around in a spacesuit - Isolated from the elements but in the middle of them at the same time. After returning to Brooklyn, we made our way back to Prospect Park by way of Bergen Street, 3rd Avenue and then 3rd Street. We made a left into the park and then ran out the Southwest exit over to McDonald Avenue and the Greenwood Cemetery. This served as the final leg to the run and one last long climb. Total stats for the run was 13 miles and 2 hours, 3 minutes.